September and early October have been relatively calm months, but nevertheless, both in international events and in the rejoinders that we have received in this forum, there were some developments worthy of serious thought. First about the views expressed in the rejoinders of Celine Pajon and Hyodo Shinji, both indicated cautious optimism for the state of peace treaty negotiations. Each indicated some structural reasons that would bring Japan and Russia closer. Pajon mentioned “energy cooperation and balance of power in Asia,” and Hyodo analyzed, in detail, security factors regarding rising Chinese military power, which structurally bring Japan and Russia closer, as symbolized by the “2+2” meeting to be held in November in Tokyo. The major event that took place in this period was Abe and Putin’s meeting on October 7 in Bali, on the fringe of the APEC leaders’ meeting. 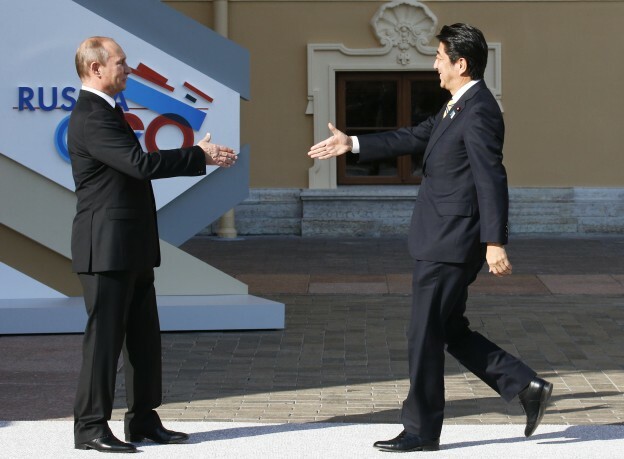 According to the Kremlin website, Putin reminded Abe about the launching of the “2+2” meeting in November and told of his general satisfaction about the developing economic cooperation, notably that “The joint economic fund that we agreed on at one of our earlier meetings has begun its work and has already received bids for financing for more than $10 billion.”1 At the press conference Putin held on October 8, he stated, “the speed of trade increase between Japan and Russia now equals the one between Russia and China” (Mainichi shimbun, Oct. 9). Furthermore on peace treaty negotiations, he stated “it is distinctly possible to realize the peace treaty with Japan. We are working based on a realistic plan. There is a need to find a friendly approach and not an antagonistic one.” (Kyodo tsushin, Oct. 8). Certainly not everything justifies optimism. I would like to follow Pajon’s two lines of analysis, first on nationalist causes in both Russia and Japan, and second on the China factor. On the nationalist cause it seems that this month revealed that there is emerging a certain gap between what Putin is indicating and how the Russian bureaucracy is responding. At the meeting in Bali, when Abe stated that “the meeting at the vice-ministers’ level should be convened as soon as possible,” Putin apparently just responded that “there could be a thorough talk with Foreign Minister Lavrov when he goes to Japan in his “2+2” meeting in November.” (Sankei shimbun, Oct. 8). This is a somewhat amazing statement because if meetings of the mind and communications were proceeding smoothly at the working level, it is simply impossible to imagine that this discussion would be reserved for the Lavrov visit. Furthermore what presidential spokesman Peskov explained to the Russian press corps after the Abe-Putin meeting, that “those who were given instructions at the working level are not catching up to the leaders’ schedule” (Asahi shimbun, Oct. 10) is an astonishing acknowledgement that something is wrong at the working level in Russia. One more episode points to the rigid mood at the Russian working level. Yamamoto Ichita, Minister of State for Okinawa and Northern Territories Affairs, joined the “no-visa” scheme and visited Kunashiri and Etorofu on September 20-23, behaving cautiously to the satisfaction of Russians in Kunashiri (Hokkaido shimbun, Sept. 21). He held a press conference in Nemuro upon his return, where he stated, “There is no need for jumping up and down and we need to continue tenaciously the negotiations.” That was the major line reported in Japanese newspapers, and some reported that for elderly former islanders, the line was too soft (Hokkaiodo shimbun, Sept. 24). But on September 26, the Russian Foreign Ministry Information Bureau issued an official statement, directing attention to Yamamoto’s statement at the press conference that “I renewed my longing for the return of these islands,” and declared that a “political statement that touches the delicate issue of the conclusion of the peace treaty is outside the agreement to conduct the negotiations peacefully and contradicts it.” Suga, the Cabinet General Secretary, stated at his press conference on September 27 that “Yamamoto has not stated anything which contradicts the ‘no-visa system.’” For most Japanese, including myself, the Russian Foreign Ministry’s reaction to Yamamoto’s cautious behavior casts doubt on the capability or willingness of some of the Russian professionals dealing with Japan. All these incidents prove Pajon’s observation to be correct. There is something not right, not befitting Putin’s directive to Russian working-level officials to proceed to resolve the territorial issue. In fact, this is one of the reasons why Panov and I thought we needed to rock the boat in July. What is going on? I had better be cautious because I have very little evidence, and my statements would become speculative. But because of reluctance to tackle a difficult issue creatively, fear that the Russian right may not support any transfer of islands to Japan, incompetence in failing to know even the minimum of what is happening in Japan, or nationalist conviction that current negotiations should be terminated, the reactions which we now see from the Russian working level are not positive. Pajon also raises the issue of nationalist feelings in Japan that are shared by even young academicians. I have a somewhat different take on this. So far as I can judge, anti-Russian nationalist feelings, which are determined to prevent any outcome other than the “four islands in a bunch” solution, are diminishing. The changing strategic environment, in which China has very clearly became the number one threat, is affecting a wide range of Japanese thinking, including our nationalist right. Instinctively, people are adjusting their strategic thinking and are looking for some solution with Russia based on compromise. Putin’s friendly messages from 2011 have been reported in Japan in a favorable light, and, arguably, his positive image is much more substantial than in America or Europe, where his autocratic and anti-democratic behavior is causing serious irritation. Saiki, Vice-Minister; Sugiyama, Deputy-Minister for political matters; Kozuki, Director-General of the European Affairs Bureau; and Ishii, Director General of the International Legal Affairs Bureau, are all top, experienced diplomats, who have not been idle. If there should be a problem on the Japanese side, it would be whether they are doing everything they can to seek all avenues on the Russian side to break the ice to create a conducive environment and the personal rapport that would maximize the prospects of finding a mutually acceptable hikiwake solution. Putin’s response is not shown on the Internet. But it is no secret that the country against which Xi is proposing to celebrate is Japan. Since Xi’s statement has, at least, a certain logical consistency, Putin surely is not in a position just to brush it aside. As Rozman has indicated, there certainly is an influential group inside Russia that is willing to push this China-friendly policy earnestly. Therefore I strongly argue that Japan needs to be careful not to do anything provocative against the Russian position on China. A naïve “China card” statement is not only foolish, but also dangerous in undermining the basis of improved relations between Japan and Russia. Furthermore, in the current tense situation, it is becoming all the more important for Japan to do everything possible to normalize its relations with China, even for the sake of creating a stronger basis for negotiations with Russia. And yet all of these considerations do not negate the importance of one of the bases of rapprochement between Russia and Japan: China. The reason is structural. China is rising so fast in all aspects, including military ones. This creates concern in countries around the region. Talking about this bilaterally may not be necessary. One understands and acts. The outcome is a friendlier and more dynamic relationship between Japan and Russia. That is enough. This already answers the second question on China that Pajon asks: “Would Russia have to provide any kind of quid pro quo or reassurance to China if it wants to conclude a peace treaty with Japan?” It goes without saying that a peace treaty between Japan and Russia does not include any clauses that harm any other country, including China and the United States, and that China is not in a position to respond negatively when Russia and Japan are following in its footsteps, when it resolved its territorial problems with Russia based on a principle of compromise. If China were to show power-politics dissatisfaction toward Russia drawing closer to Japan and tried to pressure Russia not to follow this line, no Russians that I know would be pleased. The possibility of being forced to find a quid pro quo is very low. 1. “Meeting with Japanese Prime Minister Shinzo Abe,” President of Russia—News, October 7, 2013, http://eng.news.kremlin.ru/news/6087 (accessed October 12, 2013). Hyodo Shinji, whose article appears in the Special Forum of the third issue, wrote in the October issue of Wedge on deepening security cooperation between Japan and Russia in advance of the 2+2 meeting scheduled for November 1-2. His analysis centers on Russian interest in strengthening security ties to Japan, despite the large-scale naval exercises between Russia and China in July. Hyodo argues that Putin’s interest is far stronger than many have recognized in reaching a breakthrough with Japan. Also, it is much more centered on security than is usually understood by observers. The significance of the 2+2 talks with foreign and defense ministers, to which leaders agreed at the April 29 summit, is Hyodo’s first point. For Japan similar talks are held only with the United States, as occurred in October, and Australia, starting in 2007. For Russia, there are similar talks with the United States, Great Britain, France, and Italy, but Japan will be fifth on the list and the only such partner in Asia. There is bound to be an impression that this is a response to the rise of China. Since declaring his intention to run again for the presidency, Putin has been energetically seeking security cooperation with Japan, argues Hyodo, as he shifts Russia’s center of strategic gravity to Asia. Along with Japan, this means strengthening strategic ties to the United States, Vietnam, India, and others, putting some distance from China. In support of his view that the political taboo against criticizing China is being lifted, Hyodo further notes a July article by a Russian military specialist on a scenario of a blitzing attack by China on the Russian Far East to regain land taken by imperial Russia, and a public opinion poll showing a rise from 1998 to 2013 from 3 percent to 31 percent of Russians indicating that they view Chinese expansionism as a threat to Russia. Taking a closer look at the military exercises, Hyodo interprets them differently from some other observers. China played up military cooperation much more than Russia did. The location avoided the public areas of the Japan Sea, sticking close to Vladivostok, and there was distance between China and Russia in their warmth in indicating that these were about containing the United States and Japan. Indeed, in light of various evidence about the drills and the way Chinese ships returned from them while Russia proceeded with a much larger military exercise, Hyodo argues that the real target of Russia is China’s desire for a naval presence in the Artic Ocean and the Sea of Okhotsk, which in the Cold War was considered an internal sea. Also, Lavrov went out of his way to assure Japanese that the exercises were not targeted at their country, while proposing stronger defense exchanges. On June 17, Putin had told Japan of his support for Japan becoming an observer at the Arctic Council after praising joint development by Japan and Russia of natural resources in the northern part of the Okhotsk Sea. Although China will also be one of six observers, Russia had not been in favor. It actively supported only India and Japan. In August, Russian airplanes entered Japanese airspace and Russia is modernizing its military on the Northern Territories; so the Cold War legacy is not gone. Political thinking may lead to real strategic cooperation, but much remains to be done. The November 2 Japan-Russia 2+2 summit drew many commentaries on how bilateral relations are improving more than was anticipated. They confirmed the seriousness with which The Asan Forum discussion, led by Kazuhiko Togo, has taken ongoing efforts to upgrade relations. Of course, we still find deep skepticism from many, but for those who dismissed assertions of serious intentions on both sides, this could be a wake-up call. The positive coverage heralded the opening of a new page in bilateral relations and signs of momentum that will carry over to negotiations on the territorial dispute. The surprising message for some is that common interests in security are providing an important boost to relations. On the Russian side, the emphasis is put on why Japan is interested in this, pointing to increased apprehension there over China’s expanding military presence and North Korea’s missile launches. Interest is being shown in Abe’s notion of “active pacifism,” calling for a more energetic role for Japan in safeguarding peace and security. This is seen as driving Abe to take relations with Russia more seriously. On the Japanese side, the focus is centered more on Russian apprehension about China’s maritime forces expanding not only in the south and east but also to the north. Hyodo Shinji’s piece that appears in the Special Forum of Issue 3 goes into considerable detail about this Japanese thinking toward Russia. Reactions in China and the United States to the 2+2 meetings are more dismissive, as if the implications of Japan-Russia strategic cooperation are incomprehensible. In China, Japan’s “militarism” has been so demonized and Russia’s parallel thinking to China on security so often repeated that the only way to make sense of the reports of the 2+2 meetings is to treat them as a charade with no prospects of success. The fact that the Russian side made no comment on how it felt about “active pacifism” is taken as significant, presumably suggesting wide variance in views. Moreover, the position of the Minister of Defense Sergei Shoigu that Japan-US cooperation on a missile defense system will destroy the security balance in the Asia-Pacific region is highlighted, confirming China’s understanding that its military expansion is not the cause of such destruction and that Russia agrees with this point, instead of outside analysis that China is the cause of a growing security imbalance that is driving Japan and Russia closer. From Chinese sources there would be no reason to anticipate any progress on security cooperation or on the territorial dispute. The US response put the most stress on an assertive China provoking the other two states to draw closer, but skepticism centered on Putin’s seriousness in challenging China as well as on two fervent nationalists, Abe and Putin, agreeing on a pragmatic approach not only to security but also to the emotional territorial dispute between their countries. What is driving optimism in Japan and Russia more than the other two countries is the notion that its counterpart in these negotiations is so nervous about China’s military expansionism that it now is ready to seriously consider shifting its security posture in the region as well as to compromise on the territorial dispute. Thus, the November 2 meetings appear to give some much-needed impetus to negotiations. At the same time, optimism that the other side urgently needs a breakthrough may make compromise on the territorial dispute less likely. As long as there is no candid discussion of how one’s own country needs a compromise, the security factor is now offering false hope rather than making it easier to grasp harsh realities on each side. Another factor deserves mention. Some Japanese media reported that the Japanese Ministry of Foreign Affairs was too hasty in seeking overt acknowledgment from the Russian side that the rise of China is a common concern. Russia has made it plain that it is not in a position to say anything of the sort publicly and has no intention of discussing China in its absence. Officials may have erred, not recognizing that just by holding serious security talks between Japan and Russia an important statement is being made in the context of East Asian geopolitics. NHK reporter Ishikawa Ichiyo after the 2+2 meetings commented that the next critical dialogue may come in February on the periphery of the Sochi Olympics. Putin has personally invited Abe to attend, and Ishikawa concludes that this may give Abe an opportunity to engage on the most difficult issues on the basis of strengthened personal relations. Just prior to that possible meeting, top officials are scheduled to meet, which would have added importance under this timetable. © Copyright The Asan Forum Limited 2013. All Rights Reserved.